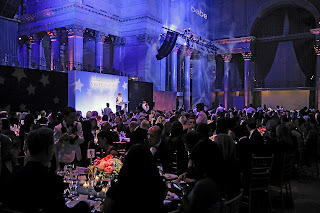 Cipriani 55 Wall Street was the setting for Fashion Group International's 29th Annual Night of Stars Award Gala (www.fgi.org ), which took place last evening. Each year, they have an overall title for the event, and this year, it was The Dream Catchers (in the words of FGI President Margaret Hayes, the "11 extraordinary talents being honored are spinners of imagination, the spirits of innovation, the weavers of the ideas that give shape and dimension to the dreams we dream.") The word "dreams" was woven into many of the speeches that followed, and as you can well imagine, Host Simon Doonan had quite a bit of fun with it (but more on that later). Among the notable guests last night: Kelly Ripa, Mark Consuelos, Seth Meyers, Liya Kedebe, Prabal Gurung, Linda Fargo, Norma Kamali, Lola Schnabel, Patricia Lansing, Lauren Remmington Platt, Vanessa Traina, Estelle Lasher, Julie Macklowe, Bibhu Mohapatra, Christian Cota, Lisa Mayock, Miguel Antoinne, Misha Nonoo, Angel Sanchez, Alexi Ashe, Pat Wexler, Carin Brooks, Claude Morais, Brian Wolk, Nina Garcia, Maria Giulia Maramotti, Jedda Kahn. True to form, Simon Doonan kicked things off in his own inimitable way. He recounted an over the top, fantastical tale centered around "an insanely trippey dream I had last night", during the course of which, he was able to weave in all the names of the night's honorees. He referred to it as "L'Wren Scott's Slumber party", though it sounded more like a nightmare, especially the part about not being able to reach L'Wren's doorknob (he is as you know, rather vertically challenged, and she is well over 6' 2" in bare feet). Glenda Bailey telling the crowd that Derek Lam "makes clothes that MAKE the woman". "He knows what women want; he could just as easily be a psychic". "His best accessory? His partner Jan (Schlottman)". For his part, Derek said that going to work each day is like "going home". He gave special thanks to FGI's Mary Lou Luther who he referred to as a "living treasure in this community" and he touchingly ended by saying "I'll work hard to earn this award". 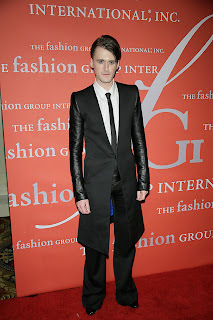 John Demsey referred to Gareth Pugh's "unique dark aspects of beauty" and described his designs as "avante garde, rebellious, classy, edgy, beautiful". He also said he was "sporting an incredible pair of flared pants this evening". Gareth confessed, "speeches are not my strong point but thank you. It's a big honor for me to be here". Karl Lagerfeld, who had literally arrived just moments before giving Haider Ackermann his award, admitted that Tilda Swinton was "the first choice" but could not be there because of a "family situation". He hailed him as "a great designer and great friend", and said he was happy to be there to give him the award the he really deserves. Haider said he was very touched to receive the award and thanked Karl. He quoted Yoko Ono who once said, "A dream you dream alone is only a dream. 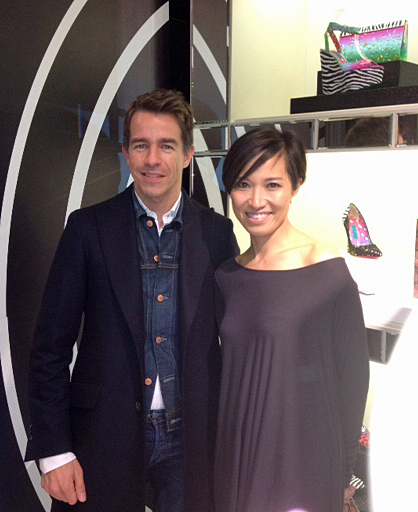 A dream you dream together is reality", and he thanked Fashion Group for "letting me dream my dream". Kim Hastreiter hailed James Gager as "a cultural anthropologist". "James is a storyteller who breathes life into his brand". He's a "natural editorial thinker". "Beauty is diverse and can come in many packages. I'm proud to give this Award to James, the ULTIMATE catcher of dreams". James said he was honored to be presented with this recognition and admitted he was "always dreaming" ("my dreams got me in a lot of trouble when growing up in Niagara Falls", he joked). "MAC makes dreams happen. I can be irreverent and push ideas of beauty forward, and hopefully, not only make women look and feel great, but put a smile on their faces". He ended by saying, "Dream more, learn more, care more, most importantly, BE more." Tory Burch said that Neiman Marcus represents the essence of corporate leadership with their "rich history and heritage". 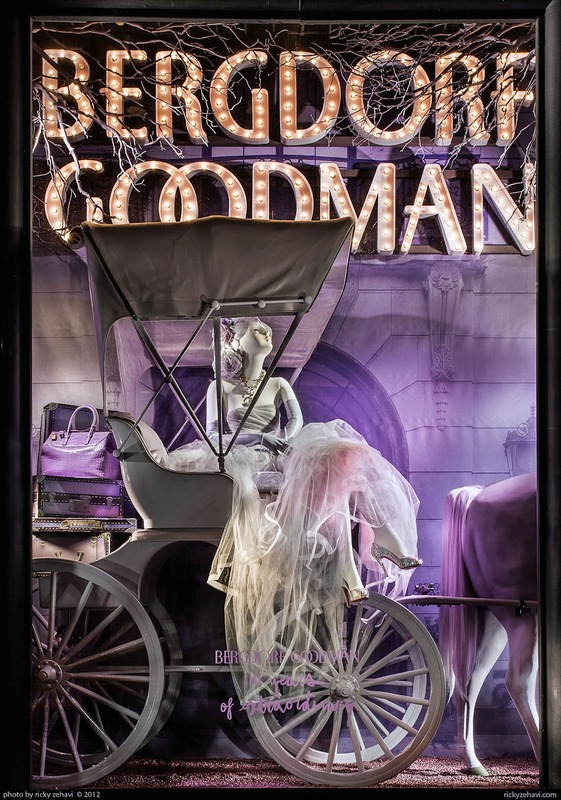 "Few stores are as glamorous as Bergdorf Goodman and Neiman Marcus". "Even though it's over a century old, it's a trend setter and cutting edge". 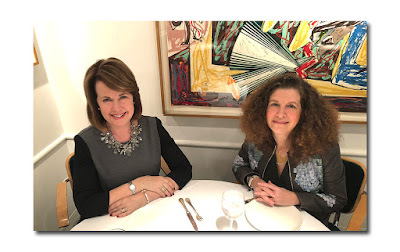 It's perfectly apropos, she said, that Karen Katz, Neiman's CEO's, was raised in Texas, "because Texas knows about bigger, better, and bolder". And even though NM is "big, bold, and creative, they manage to keep an amazing attention to detail". Viola Davis, presenting the award to the Maramotti Family (Max Mara) admitted that she knew "very little about fashion". "But I DO know about myself, how to define my own beauty, and own it." "Fashion can't be worn; it has to be something that enhances what you are rather than hide it". Nicola Maramotti said "we inherited values, passion for quality, and a constant search for excellence" ("these are family traits"). "We believe in quality from start to finish. We look forward to another 60 years of success in the business." Sarah Jessica Parker sang the praises (and wisdom) of good friend L'Wren Scott. She said she "understands fashion" and has always been a "visionary". "She has a perfect eye for color and proportion", and then went on to note, "she makes a woman's derriere look better than anyone in the business". "She's a real girlfriend to me and other women, and a perfect choice for the Oracle Award. She then read a congratulatory letter from Mick Jagger (her longtime boyfriend), who could not be there because he's in Paris.She said she wanted to do it with a British accent but decided not to. L'Wren (in a form fitting dress showing all her curves), made the astute observation that "men only understand fashion if it has a waistline" and then told Simon he could use her long hair to "climb up (like Rapunzel). that got a lot of laughs. Winton Marsalis said, "the greatest thing we will ever encounter, is other people"
Norma Kamali, an icon in the fashion industry said, "I design Kamali culture an ecommerce collection. Its a more career type collection but of course swimsuits are still a big part of my collection. A big focus of my career is on wellness now because if you don't feel good when you take off the dress then what is the point? But designers should not be afraid to make mistakes I made plenty of mistakes and this is pivotal for the growing process." Demitri Sholokhov, who recently won Project Runway, was very excited by this win but felt slightly overwhelmed and realizes "(he) needs business partners and investors, while Project Runway gave me great exposure this is only the beginning of my journey. A big inspiration for me is Alexander McQueen a great creative talent. But now that I have achieved a certain level of recognition I have to begin marketing it." Kelly Ripa was there to honor Carolina Herrera who she said, "gives me stability even when I am wearing a strapless dress. Her clothing is classically elegant and I love everything about her." Voila Davis, the actress, said she loves "people who are not afraid to take fashion risks who don't just follow the trends. Max Mara is my favorite designer the cut and the fit is just perfect everything about it is classic." L'Wren Scott said she "loves Fashion Group International and was thrilled to be honored at this event." Karl Lagerfeld, the king of fashion, waltzed in at nine with his trademark sunglasses and high collared shirt and even though he was silent he left the crowd speechless. At the end, Simon joked, "I'm available to interpret anyone's dreams", and added "I accept all major credit cards." Before we were sent out into the night, each guest was handed an enormous black 'snakeskin' tote bag filled with goodies, among them a Nokia phone, custom designed by L'Wren Scott (her first such collaboration), a sampling of MAC cosmetics, a Lord & Taylor gift certificate, a Max Mara scarf, Carolina Herrera fragrance for men, and Godiva chocolates. The lead sponsor for this year’s event was Lord & Taylor. Participating sponsors: Arcade Marketing, Bebe, Givaudan, InStyle and Movado and the event was expertly handled, as always, by Diane Clehane, Madeline Communications (DClehane@aol.com). A cocktail reception celebrating the collaboration between Robert Pruitt and Jimmy Choo was held at the Jimmy Choo store on 407 Bleecker street. Robert Pruitt is a contemporary artist who has gained fame for his glittering panda bear paintings, his sculptural blue jeans, and his silvered Andy Warhol monument on public view. Pruitt produces art that is both profound and playful a perfect partner for the Jimmy Choo brand. 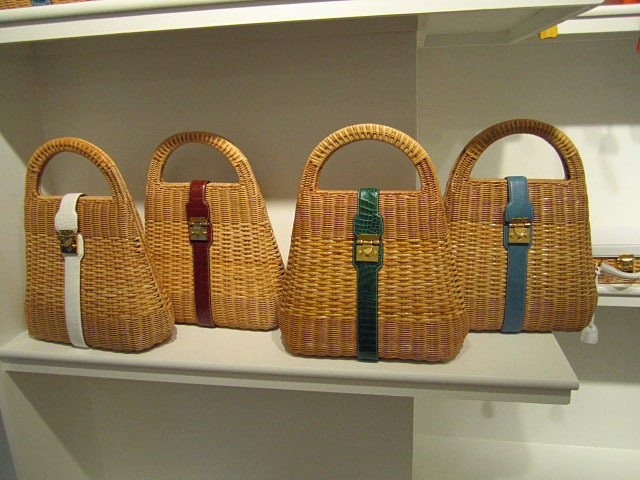 This was primarily a launching ceremony and fashion writers and connoisseurs came to view the collection. The evening started with some wine and hors d' oeuvres. The atmosphere in the store was very festive especially after some great beach cobblers - consisting of apple martini, rum and pineapple - were sampled by the crowd. However, after all the pleasantries it was time to get down to business and learn why so many had flown in from London for this event. Robert Pruitt designed four different gradient prints and the creative directors at Jimmy Choo, Simon Holloway and Sandra Choi, used these prints to adorn shoes and bags. 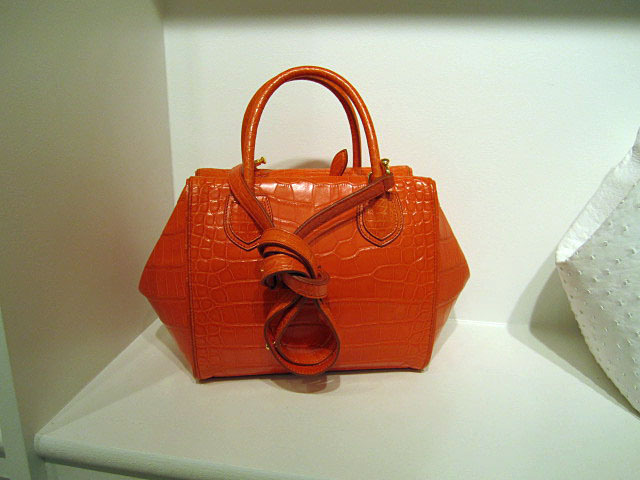 Simon Holloway said,"this was developed in the context of our cruise collection. It is a celebration of color and confetti like New Years Eve. We superimposed the idea of confetti and ice cream onto our bags and just had fun with it. 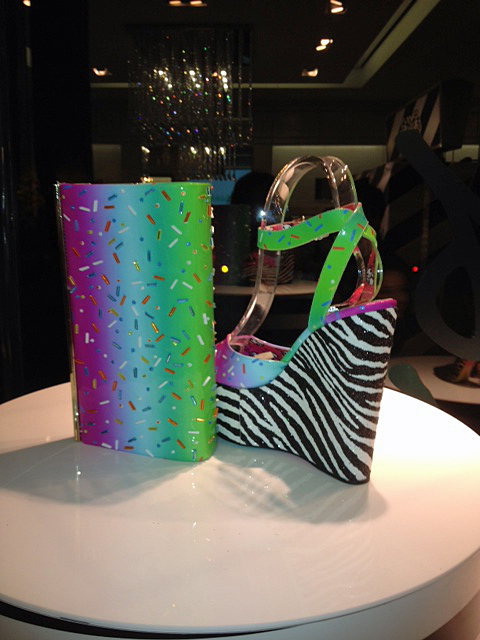 We framed our shoes with a zebra gradient print and put french lace and mirrors on our acrylic bags. This was our most comprehensive collaboration yet and it is very exciting." Sandra Choi lamented her jet lag but said she was so excited to just feel "free and have some fun with the designs." A celebratory cartoon was then shown depicting, through the use of panda bears, this exciting joint venture. I took a picture of myself in the photo booth set up for the evening and then grabbed a pink tote "goody" bag. Inside the bag were pictures of the various items produced in this exciting collaboration -the signature one being the angel and devil minaudiere clutches. These clutches feature more than 11,000 hand applied crystals and are available in a limited edition of 14 which are each signed by Robert Pruitt. I left the event with a newfound familiarity with the work of Robert Pruitt and a lot of information that I need time to "Choo" on. The Smithsonian's Cooper Hewitt National Design Museum celebrated it's 2012 National Design Awards with a ceremony and dinner at Pier Sixty in New York. 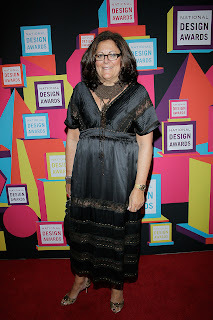 Michelle Obama served as the honorary patron of this years awards and sent her social secretary to thank winners for bringing design greatness to the United States. Winners of this years awards were chosen by a panel of design experts and educators from thousands of nominations submitted by the public. This years winners included a Lifetime Achievement Award for Saul Wurman, a design mind award for Janine Byrus, and a Fashion Design Award for Thom Browne (See his collections here). The red carpet was filled with design, fashion and media luminaries. 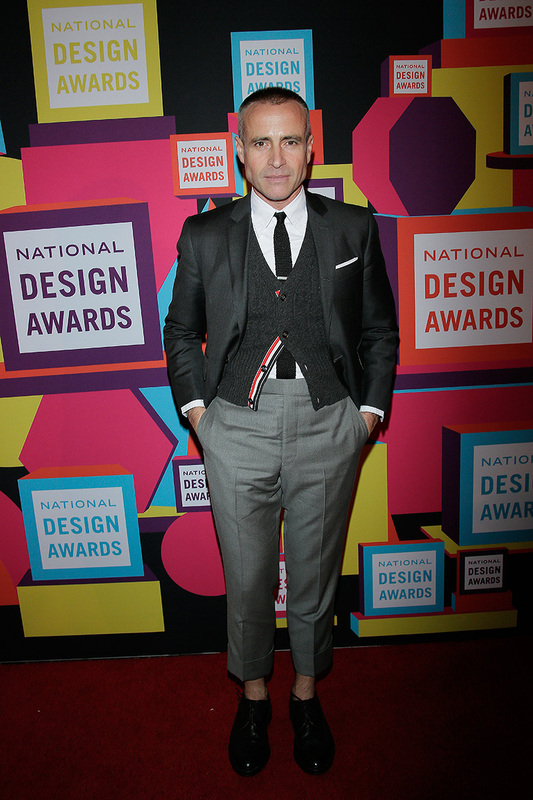 Paula Zahn, Todd Oldham and Fern Mallis were there to support and pay homage to acclaimed designer Thom Browne. 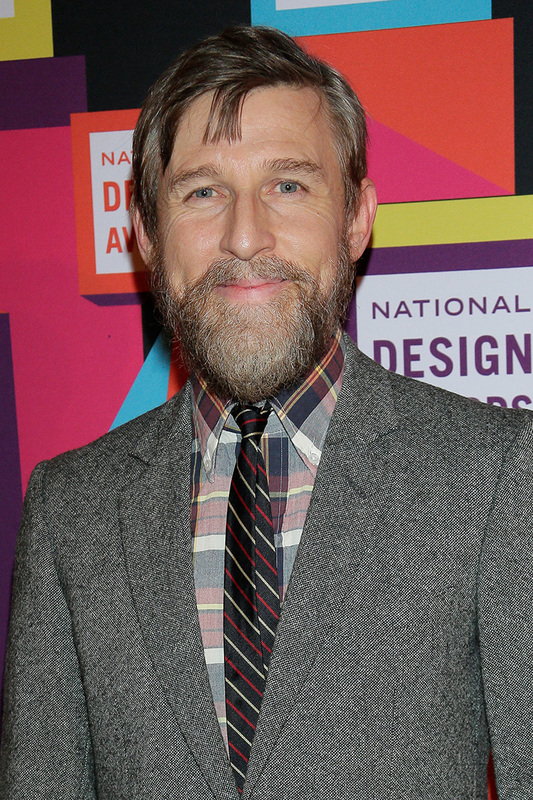 When I asked Todd Oldham about the design awards honorees he said, "I have incredible respect for Thom Browne. 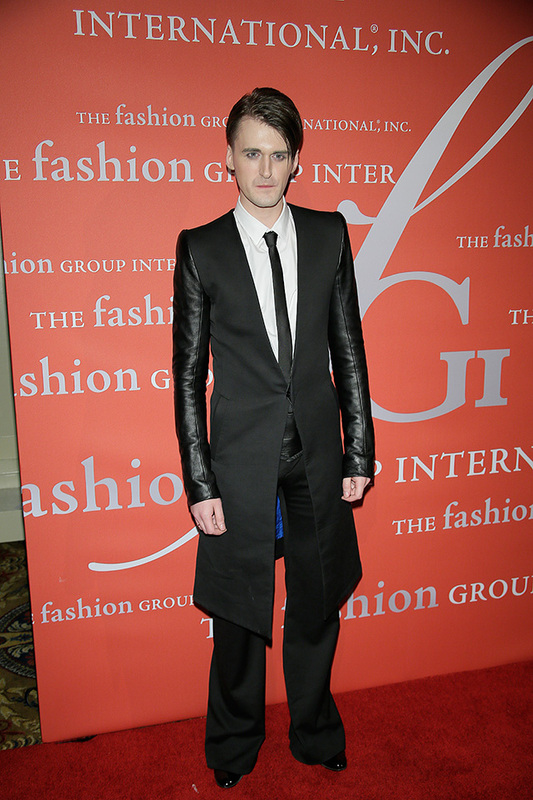 Thom has physically reshaped classical design with a modern respect for beautiful tailoring." Mr. Oldham then stated, "I myself no longer design clothing since I have nothing else to state in that medium. I now design books and buildings because if you know how to sew you can do everything." (I will have to tell my grandmother that). Thom Browne said he was very excited to receive this award and "(he) designs clothing for real people. I am inspired by anyone who can sustain themselves in the design industry. But more specifically Rei Kawakubo from Comme Des Garçons was like nobody else in terms of design." Saul Wurman winner of the Lifetime Achievement Award said "the most important thing to design is your own life." On that sobering note, I decided to leave this magnificent event to take care of some bills and start designing my budget for the upcoming year. The definition of Fiesta, is "an event marked by festivities or celebration", and the synonyms are festival, fete, holiday, gala, feast, celebration. While all the above perfectly describe the 4th annual Fiesta 2012 Gala, which took place on Wednesday evening at the Mandarin Oriental Hotel in the Time Warner Center, one important word was left out: benefit. Because more important than the festive atmosphere, the elegant venue, the fabulous evening wear, the delectable food, and the joyful camaraderie enjoyed by the international social elite from 5 continents, this glamorous black tie evening (considered to be of the last real society galas in New York), raises money for the Casita Maria Center for Arts and Education (www.casita.us ), located in one of the poorest neighborhoods of the Bronx. Founded in 1934 by Claire and Elizabeth Sullivan, two schoolteachers in East Harlem, it supports young people and their families through high quality social, cultural, and educational opportunities. This year, the benefit raised $528,800 dollars – the silent auction raised $32,900. Cocktails began in the hotel’s lobby lounge at 7:30 PM followed by dinner and dancing in the ballroom, and guests danced to the music of The Bob Hardwick Sound. 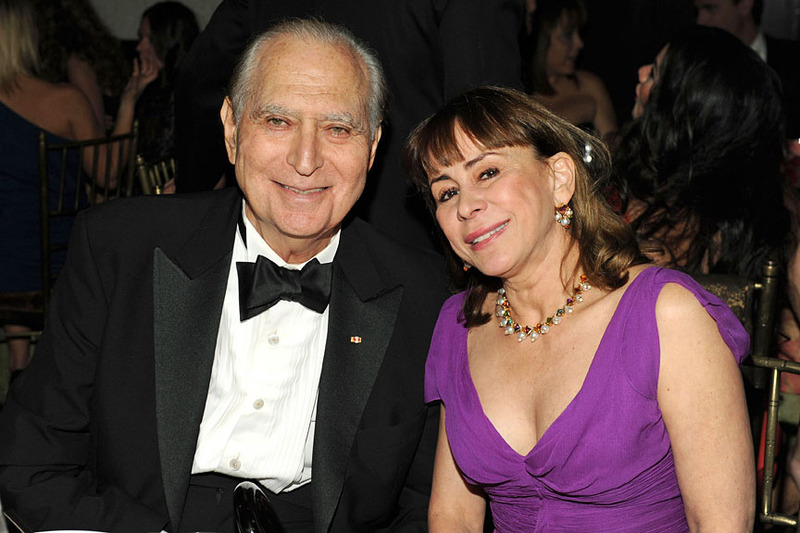 Over 370 attended, including Prince Dimitri of Yugoslavia, Princess Kovalenko, Fe Fendi, Tony Bechara, Enrica Arengi Bentivoglio, Deeda Blair, Peter Bacanovic, Geoffrey Bradfield, Mario Buatta, Consul Maria Elena Cabezut, Coty Cisneros, Luis Guillermo Cisneros, Kiera Chapin and Oliver James, John Demsey, Pierre Durand, Tiffany Dubin, Jacqueline and Ronald Drake, Audrey Gruss, Jamie and Peter Gregory, Yaz Hernandez, Elizabeth Jacoby, Ambassador John L. Loeb and Sharon Handler Loeb, Christopher Mason, Mary McFadden, Sydney Picasso, Hunt Slonem, Steven Stolman, Stephanie Stokes, Angel Sanchez, Lilly Scarpetta and Roberto Pumarejo, Christopher Trump, Barbara and Donald Tober, Anne Rapp, Adrienne and Gianluigi Vittadini, Cecile David-Weill, and Sabrina Wirth and Aaro. The Chairmen were Jacqueline Weld Drake, Aileen Mehle, and Prince Dimitri of Yugoslavia. Mario Buatta was the Master of Ceremony. This year's honorees were Lilly Scarpetta de Pumarejo, Pierre Durand, and Marina B, the granddaughter of Sotirio Bulgari, founder of Bulgari. (Kiera Chaplin, the granddaughter of Charlie Chaplin, accepted the gold medal on her behalf). Fashion Icon Katharine Hepburn on display in the exhibition Katharine Hepburn: Dressed for Stage and Screen starting October 18 at the New York Public Library for the Performing Arts. The exhibition includes over 40 costumes and clothing items from Hepburn’s personal collection. The exhibition – organized by Kent State University Museum and travelling the US - was created in conjunction with a new book released this month, Rebel Chic (published by Skira Rizzoli, 2012). The exhibition is being held at the Donald and Mary Oenslager Gallery from October 18, 2012 thru January 12, 2013 at The New York Public Library for the Performing Arts, Dorothy and Lewis B. Cullman Center at 40 Lincoln Center Plaza. Admission is free. Katharine Hepburn: Dressed for Stage and Screen includes selections from Ms. Hepburn’s personal collection of performance clothes, featuring memorable fashion items from some of her most celebrated performances on stage and screen including: gowns from The Philadelphia Story, Adam’s Rib, and Long Day’s Journey into Night, and casual modern dress from Guess Who’s Coming to Dinner and On Golden Pond. Stage costumes designed for the star by preeminent designers Valentina, Howard Greer, Cecil Beaton, and Jane Greenwood and film and television costumes by Margaret Furse, Ruth Morley and Noel Taylor are on display in the exhibition. Additional insight into Hepburn’s input into the garments can be seen in the exhibition through costume research, correspondence and sketches in notebooks and scripts from the Katharine Hepburn Papers that is housed in the Billy Rose Theatre Division at The New York Public Library for the Performing Arts. The exhibition also includes pieces from her personal wardrobe - clothing that was worn for publicity appearances, as well as for casual and rehearsal wear - providing various examples of Hepburn’s “rebel chic” style, including seven pairs of her iconic khaki pants. The exhibition is augmented with film stills, posters and playbills that span her long and distinguished career in theater, film and television. 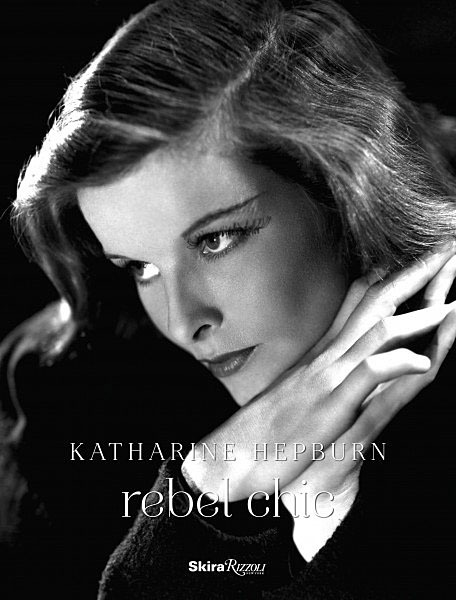 Celebrating the new exhibition and the release of Rebel Chic, the Library for the Performing Arts is hosting a free program, Katharine Hepburn: Rebel Chic on Thursday, October 18 at 6:00 p.m. in the Bruno Walter Auditorium. This panel discussion with book contributors, Barbara Cohen-Stratyner, Nancy McDonell, Judy Samelson, Kohle Yohannan and moderator Jean Druesedow, will discuss Hepburn’s dual roles as hard-working actress and fashion icon. Grace Kelly with Mark Cross overnight bag featured in the movie "Rear Window"
Mark Cross, America's first luxury leather goods house, was established as saddlers and harness makers in 1845 Boston. The company was bought three decades later by Patrick Murphy and, in 1902, they opened a store on Fifth Avenue in Manhattan. It was then passed on to Patrick's son, Gerald, who along with wife Sara, were the power couple of "The Lost Generation", They counted such luminaries as Man Ray, Picasso, Ernest Hemingway, and Zelda and F. Scott Fitzgerald as friends and customers. In fact, they were the inspiration for F. Scott's "Tender is the Night". 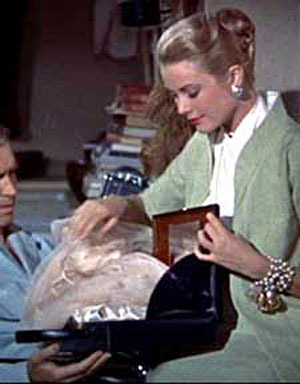 The company's status was firmly cemented, and they became a household name in 1954, when Grace Kelly, playing socialite Lisa Fremont in Alfred's Hitchcock's Rear Window, arrives at the apartment of her boyfriend -- played by Jimmy Stewart -- with a lacy negligee and slippers in an elegant Mark Cross Overnight Case. (The audience knew the exact brand because she announced it). But still, they found themselves closing their business in 1997. Fast forward to 2010. Mark Cross www.markcross1845.com was bought back by a group of investors who believed strongly in the iconic brand. 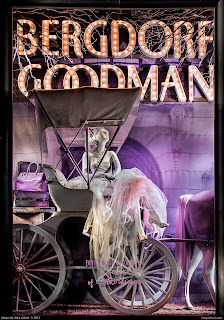 In 2012, it was re-relaunched and debuted at Barney's New York exclusively. The brand will soon be available at a number of SELECT stores around the world -- according to Martha Kramer, Senior Vice President. I attended a press preview of Collection 1V for spring 2013 last Thursday, and let's just say, I wanted everything. It is the perfect balance of timelessly chic and elegant, AND modern and contemporary. These are styles that will endure, will transcend "trends", the vagaries of "in" and "out", and will never look dated. 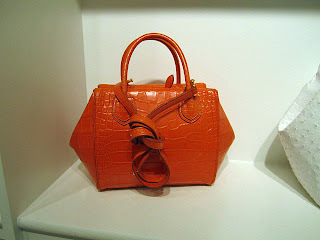 The items in the well edited collection range in price from about $575 for a zippered wallet in soft pebbled calf, to $19,500 for a Grace Box bag in crocodile (an updated version of the one made famous by Grace Kelly). Each bag is hand made, lined in red leather or in linen, features functional multiple pockets (and a back pocket), gold zippers, and distinctive gold hardware. When locks are used, they are the original locks from the 20's, and they have the matching keys of course. Only the finest skins are employed: lambskin, pebble calf skin, Saffiano leather, natural cowhide, and exotics like ostrich, lizard, and crocodile. But there are some nice surprises, such as the undeniably spring like Man Ray group, made of rattan, with leather and crocodile accents. The chic, pared down silhouettes (mini trunks, top handle and shoulder satchels, large flap shoulder bags, large hobos, clutches, mini wrist lets, etc. ), are inspired by the original archives (the collection is designed in New York but made in the same Italian factory that produced the originals). There are also handsome unisex folios and wallets, and more additions are planned for the future (luggage and a men's collection). The colors: cuoio, orange, yellow, green, white, blue, black, and a rich Mark Cross red, are simply put, just THE perfect shades. Styles are given names like Grace (Grace Kelly), Scottie (F. Scott Fitzgerald's daughter), Zelda (F. Scott's wife), and May Ray. According to Ms. Kramer, the best sellers have been the Grace Box bag, the Madison doctor's satchel, and the Scottie, which has been seen, as of late, on the arm of Taylor Swift (she carries it everywhere, day and night). on the runway last night at the store. 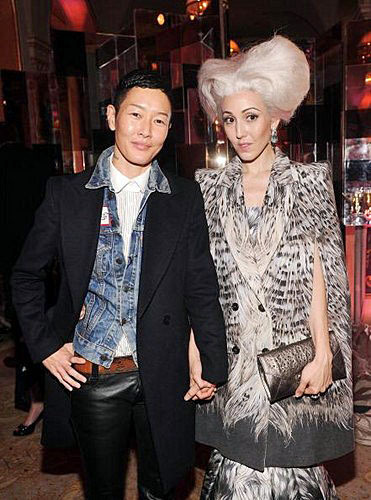 ﻿﻿The event was held at his new store at 39 Wooster Street, Soho. 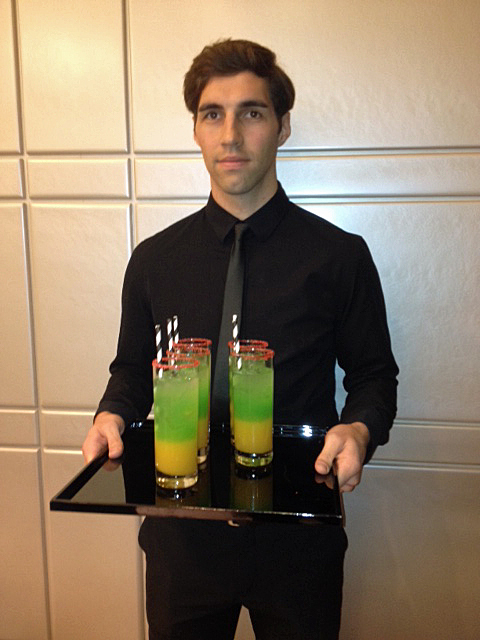 It featured a dj, savory appetizers and a runway presentation of his Spring 2013 collection. The crowd was an eclectic mix of downtown artists, fashionistas and sports figures. 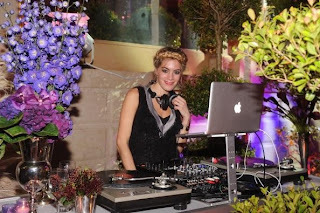 The guests were treated to a variety of hors d'œuvre such as caviar and mini grilled cheese sandwiches with champagne, beer and cocktails served throughout the evening -- all with accompanying music by a dj. Both the men's and women's collections on sale featured a predominantly black & white palette - many pieces showing beautiful leather accents, creative textures and cutting edge details. The show featured models wearing Miguel's latest designs in evening and casual rtw. 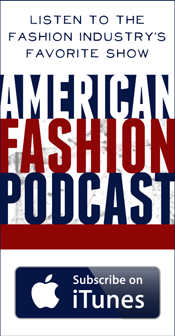 ﻿﻿After the show, I spoke with Miguel, a 2011 winner of a FGI Rising Star Award, about his designs. He said, "(he) works with a canvas of black and white with splashes of color. My focus is on building the brand. I search for the best fabrics imported from Italy and Japan in order to make an individualistic statement. This is my only store and I just want to produce the most beautiful pieces I can." He was quite humble and approachable, and it was the vibe throughout the event from the salespeople to the models. Among the guests were Giants stars Andre Brown and Ramsay Barden. Ramsay said "the designs are great, the cut is great and when you are very tall it is hard to find great designs that are long enough to fit your body and Miguel does just that. He fits the clothing to your body". Andre Brown was also very excited to wear his trench and pea coats on his upcoming trip to London. Party guests left with a goody bag filled with delicious truffle popcorn. However, that was only part of the treats awaiting them. Outside was a sweet truck filled with cookies brownies coffees and cappuccinos. This was a fitting and savory end to a delightful evening. Press for the event was ably handled by Deborah Hughes Public Relations. Election Day is not until Tuesday November 6th, but in the next 3 days, you can put your patriotism to good use, cast your (monetary) vote for Votary by Luigi Bianco http://www.kickstarter.com/projects/votary/votary-knitted-scarf-and-blanket-collection and enable this New York based upstart, to get off the ground. They are one of more than 30,000 creative and innovative projects (culled from the worlds of fashion, food, publishing, music, technology, films, games, art, design, etc.) that have been hand picked by Kickstarter, and given a chance to come to life through the direct support of others. Since Kickstarter's launch in 2009, more than $350 million has been pledged by approximately 2.5 million people, who have funded over 30,000 projects. Depending on what you pledge, you not only help to back a company financially, but you get to pick from a number of items that are available to chose from. In the case of Votary, if you pledge $30 or more, you get a canvas tote, and if you pledge $70 or more, you can select from their well edited collection of eye catching, graphically patterned, premium knitted, over sized scarves and blankets (12X67, 53X67). All are made of double paneled, reversible, 100% acrylic (with full knit construction and a hand that feels like merino wool). My two favorite prints are Kent in ecru and black, and the classic American flag in red, white and blue (though other color combinations are available). For obvious patriotic reasons, with Election Day approaching, it could not seem more timely. 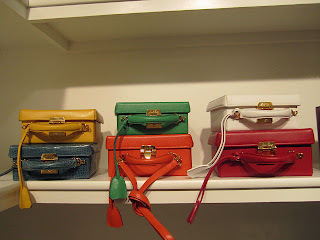 Another one of Kickstarter's fashion projects is Stacy Lomman: New York (www.stacylomman.com ). Ms Lomman, a true artist and innovative creator with a singular vision and very specific point of view, launched her eponymous line in 2010. She has a number of formal runway shows under her belt, and has garnered much attention and critical acclaim. She is no stranger to Kickstarter, having successfully partnered with them previously, in order to fund past collections. 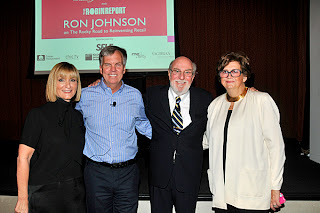 "The Rocky Road to Reinventing Retail"
Yesterday, I attended "The Rocky Road to Reinventing Retail", a luncheon and in-depth conversation with Ron Johnson, the CEO of JC Penney. The sold out event, was made possible by Fashion Group International (www.fgi.org ) and The Robin Report, and sponsored by Self Magazine, Cotton Incorporated, Chic TV, Master Card, Goldman Sachs, and Me-Ality.com. The man of the hour, Ron Johnson, who literally started a retail revolution in his less than one year at the helm (YUP! ), would have an opportunity to explain his game changing strategy to the audience, without giving EVERYTHING away of course, followed by a q & a from members of the audience spearheaded by Robin Lewis. A lunch of cold chicken breast, salad, cheesecake, berries, iced tea, and coffee was served and it's worth noting that it was was appealing to the eye, tasty, accessible, efficient (we were told he had 20 minutes to eat), and provided good value -- much like JC Penney. Laura McEwen, VP and Publisher of Self, then took the podium and made her introduction. She reminded the audience that in our current retail climate, "tastes change at supersonic speed and consumers get bored easily and quickly". "Marketers are faced with the daunting challenge of keeping consumers from getting bored" she said, and went on to observe that, "the average attention span of an adult is 8 seconds, that of a gold fish is 9" (this elicited a big laugh). "It takes a genius to re invent a product and we have a genius in the house: Ron Johnson". Next up was Robin Lewis who exclaimed that the "lunch was sold out" and "it was the "most people we have ever had" at this event. He said that Ron Johnson "fundamentally disrupted JC Penney" with his trans-formative vision, and he is creating a "new way to elevate value". "He is unwavering in his conviction to achieve". When Ron Johnson walked on stage, it was hard not to notice how casually dressed he was, clad in a blue pinstriped shirt and navy trousers. The first thing the 53 year said was that he was "informal" ("I dressed for this event" he boasted. "I worked for 12 years at Apple" as if to explain). In true salesman form, he proudly pointed to his shirt and his pants and described them as JC Penney items, even giving their style numbers, prices, and descriptions. "We are here to do something significant, something that matters". "I have always wanted to things that matter." And he spoke a little about his stints at Target and Apple. He described the 110 year old JC Penney as "one of the great American companies, which is founded on the Golden Rule. It has core values, a great history, and was the first to have chain stores". "We want to take a company that's been behind in every area, and put it WAY up front. (He emphasized the word WAY)"
"We are looking forward and we want to grow for the next few decades". "We will be the FIRST specialty department store; a collection of shops with a new base for retail". "Customers love brands they can rely on. We will be a new store that will be a collection of 100 shops". "You will be able to walk into JC Penney and have everything you are looking for all under one roof; it will be easy to meander in and out, and you won't have to keep checking out". "What we are creating is a street where people will love to be. Instead of the aisles being 9 feet wide, they will be 15 feet wide. We will fill the street with activities so that people will want to hang around longer" (and he spoke about coffee and yogurt shops, Lego for the kids, tables, iPads, Maps, Internet Access). "We will have a seasonal space built in, a half a mile street, a square, and an entirely new technology platform." "We are always listening to our customer. We changed our pricing to deliver value in a fair way." "Our goal is to put power in the hands of the customer". We will revolutionize the way people shop, connecting the customer with the creators and inventing a place where they can connect. And then we will disappear". "The price change is so important. The price ticket is the ultimate measure of value." "We will get there step by step, store by store." "A lot of people thought we were crazy because we were changing the model, but that's what it needed to get ahead. The world needs change and it needs leaders. We will reinvent retail." He promised that JCP will be a " unique collection of goods, and it will make it fun to shop". The three most important elements for success, in his opinion: 1 - Show your vision 2 - Speak the truth 3 - Treat people fair and square. I guess you can say that by the time it was all over, we got a glimpse into how a "Penney" really WAS saved, and everyone would agree that Johnson is literally worth every "Penney".